For nearly two years women cleaners have led the 3 Cosas Campaign at the University of London, fighting for improved sick pay, holidays, and pensions. Among the campaign leaders was Sonia Chura, a Bolivian cleaner who has been Vice-Chair of the University of London Branch of the IWGB for the past two years. After a 2 day strike in November of 2013 the University of London announced that cleaners and other outsourced workers would be entitled to up to 6 months sick pay, 33 days holiday, and access to the Cofely pension scheme. This was a groundbreaking victory which paved the way for similar victories months later at SOAS, Birkbeck, and the London School of Hygiene and Tropical Medicine. In the Summer of 2014 the University of London shut down three student residence halls where Sonia and the most activist of her colleagues worked as cleaners. The workers at these halls applied for permanent jobs to avoid redundancies but none of the most active trade unionists were given permanent positions. And the Recruitment Manager was none other than the infamous Sharon Bracey who doubled as the UNISON rep. 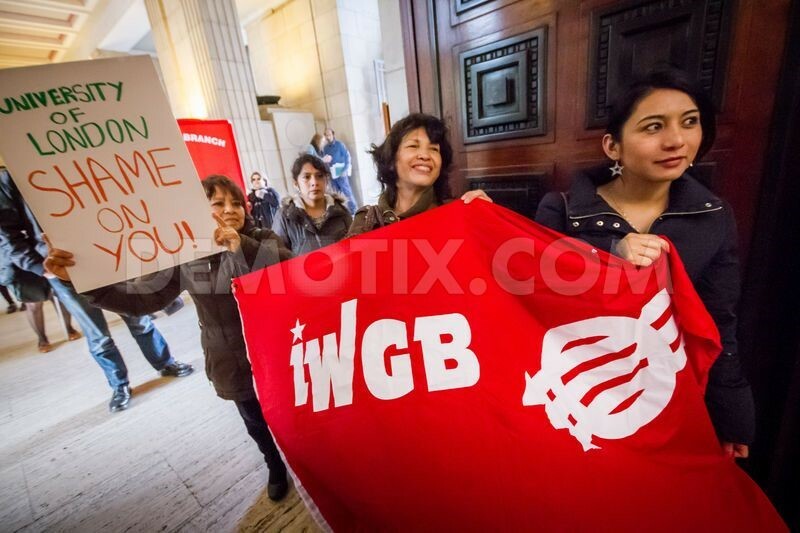 The IWGB therefore submitted an employment tribunal claim for trade union victimization. After submitting the claim Sonia and two others were given permanent jobs, but the claim continues. On Monday 16 March seven women who were at the forefront of the 3 Cosas Campaign are taking their employer to court. The tribunal lasts 10 days and is open to the public. They want you there for moral support. Full details including location can be found on the Facebook Event here. PROTEST Friday 13 March 1pm! London Living Wage at the Royal College of Art Now!